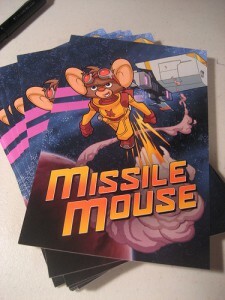 Missile Mouse is a full-color science fiction funny animal comic (whew!) created, written, and drawn by Jake Parker. His new creation is Missile Mouse Book 1: The Star Crusher, a 128-page adventure graphic novel. “Missile Mouse, secret agent for the Galactic Security Agency, is a risk taker and a rule breaker, which is why he’s in hot water at GSA headquarters. Then RIP, the Rogue Imperium of Planets, kidnaps a scientist who knows about the Star Crusher, a doomsday machine capable of destroying the entire universe. Time to let loose the mouse! Missile Mouse battles giant space slugs, corrupt agents, killer bugs, and a pair of shark-headed thugs to save the day (and the scientist!). And when he’s sucked into the exploding Star Crusher, he becomes pure energy . . . energy that will consume him unless Missile Mouse can release it and destroy RIP’s spaceship fleet in time.” It’s available in hardcover and softcover editions, coming this December from Graphix. Jake has an extensive blog, showing step-by-step how he creates artwork for both the Missile Mouse comic and various publicity.